Performs multiple linear regression analysis including confidence estimates and creates an ANOVA table. A one-dimensional array of length N containing the dependent variable [y(N)]. A one dimensional array of size N or a two-dimensional array of size [(N,M)] where M is the number of independent variables. See the Description section below for more comments. The one-dimensional array, say b, returned is size (M+1). This will contain the y-intercept and the partial regression coefficients associated with each independent variable. In addition, many statistical quantities are returned as attributes of b. The return values will be of type double if x or y is double, and float otherwise. 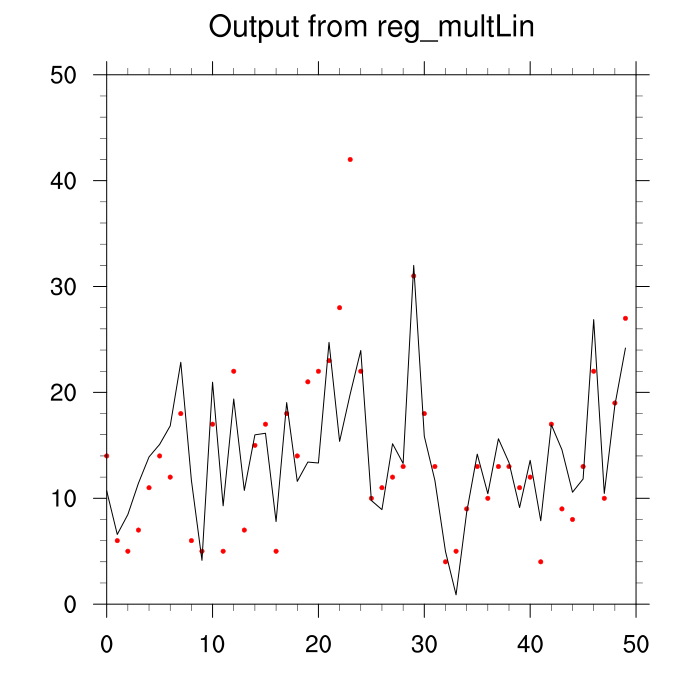 reg_multlin_stats performs a multiple linear regression. A one dimensional array (call it b(M+1)), containing the y-intercept and the partial regression coefficients is returned. The coefficients represent the rate of change in the dependent variable for a unit change in the independent variable, under the constraint that all other independent variables are held constant. The input argument x for the function reg_multlin_stats differs from that input to the builtin function reg_multlin. The builtin function requires the user to create a 'design matrix' which consists of a 'dummy' column of 1s and the independent variables. This is a bit cumbersome. This function requires only the independent variables be input. The function creates the required 'design matrix' internally. Since the B are expressed in units of standard deviation they may be directly compared with each other to determine the most effective variables. The user may wish to take into account the uncertainty associated with each estimated parameter and the overall uncertainty. This information is returned as the attributes stderr, tval and pval. In addition, an ANalysis Of VAriance [ANOVA] table is returned in the form of attributes (see example). While missing values are allowed, it is recommended that users not input any missing independent values. It just confuses the results. Missing values should be indicated by the _FillValue attribute. Partial regression coefficients (b) and additional statistics are returned. Setting print_data=True resulted in the input data being printed as a table. The print(b) yielded the following (edited) output. All the comments were manually added. Signif. codes:  0 ***, 0.001 **, 0.01 *, 0.05  . A scatter plot of the data and the resultant fit is here.